I entered this recipe in Bob’s Red Mill Spar for the Spurtle recipe contest back in July. Yes, I have been holding out on you. Shame on me. Well, bottom line, I did not win *silent weep*. But you know what: it doesn’t matter. They do not know what they’re missing. 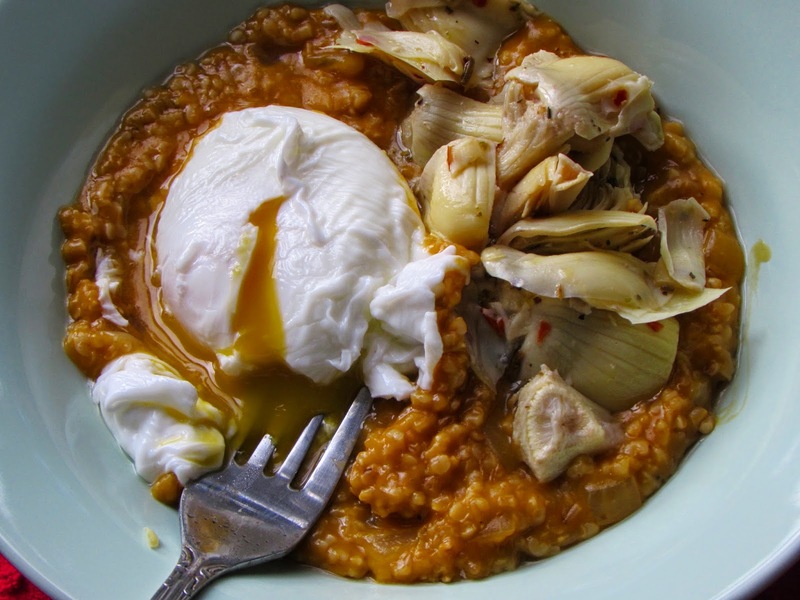 Warming risotto-style oats, topped with a splash of acidity from marinated artichokes, and a pillow of creamy egg. Ah, heaven. My mouth is watering just thinking of that oozing yolk… Looks like I will have to reunite again with this recipe, which is utterly perfect for a cozy winter night at home. Paired with a leafy side salad and a glass of wine, it would also steal the show at a small dinner party. I say small because bulk poached eggs is not a thing, unless you have one (or three) of these little numbers. 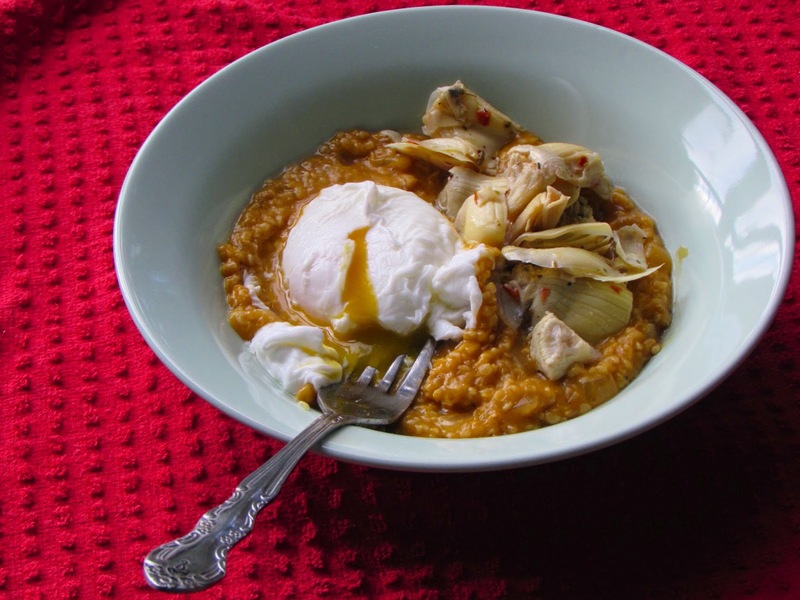 This was adapted from a Martha Stewart recipe that is included in her book, Meatless. There, however, it was made with creamy polenta. The boyfriend and I tried it out one night when we were looking for an easy-peasy dinner. Some polenta, artichokes, an egg. How good can it be with so few ingredients and such few steps? Lo and behold, our eyes bulged open at the first bite. So. simple. yet, so good. Oh, Martha. Heat the 2 tsp of olive oil in a medium saucepan over medium heat. While the oil is heating, marinate the artichokes: mix the artichokes, 2 tbsp olive oil, 2 tbsp red wine vinegar, italian seasoning and red pepper flakes in a bowl. Set aside. Once the oil is hot, add the onions and garlic. Sautee 3-4 minutes or until translucent. Add the oats and sautee for one minute. Add the white wine and stir for a few seconds. Then, add 3 cups broth. Stir. Put a lid on the pot and bring the mixture to a boil. Once boiling, reduce it to simmer, with the lid on. Simmer for 20 minutes, stirring occasionally. About 10 minutes into the ris-oat-o simmering process, fill another medium pot with water and bring to a boil on a second burner. Add a splash of white vinegar to the water (optional). Reduce the water to a simmer. 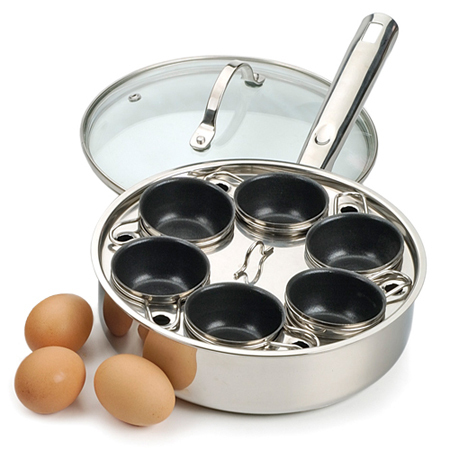 Crack an egg into a small bowl and gently slide it into the simmering water. Swirl the water to keep the whites together. Repeat with remaining eggs. Poach the eggs for 4-5 minutes. By this time, the ris-oat-o’s 20 minutes should be up. Check to see if additional broth is needed (1/2 cup to a cup), and add if so. Taste to see if the rice is cooked. If not, continue to cook for 5-8 minutes more. Stir in the cheese. 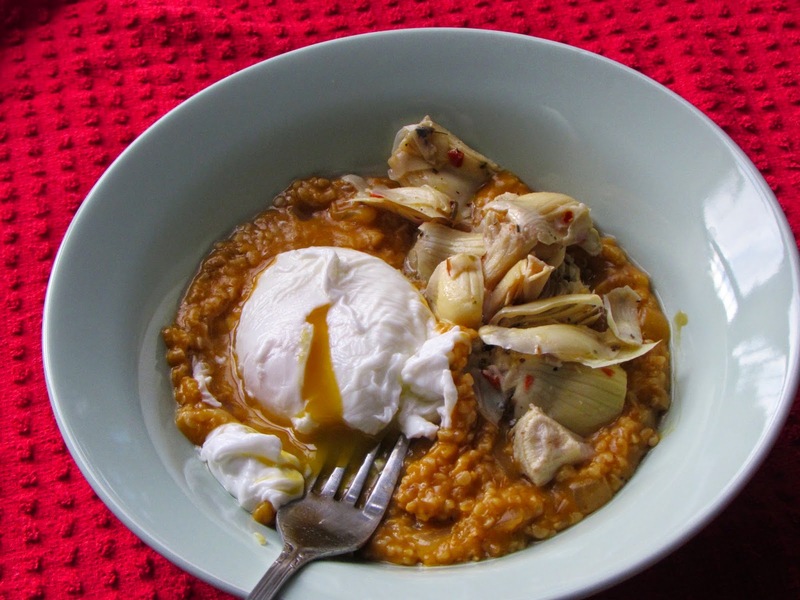 Ladle out ris-oat-o into 4 bowls, and top each bowl with artichokes and a poached egg. Savor. Notes: 1) I made this recipe for a Bob’s Red Mill oatmeal recipe contest, so of course I suggested using their brand. However, any brand will work just fine. 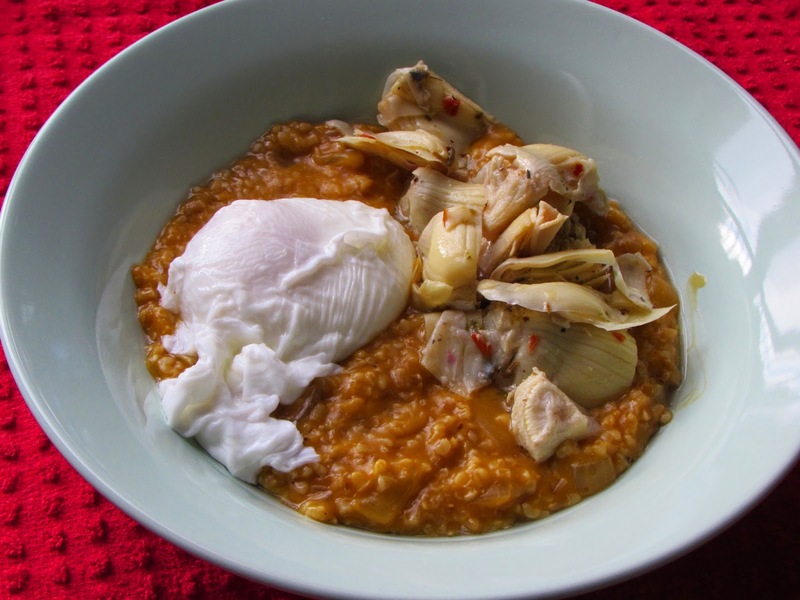 I adore all Bob’s Red Mill products, so if you can find their Steel Cut Oats, I highly recommend using them. And, no, I am not being endorsed to say any of this! 2)You will likely have leftover artichokes, which are divine atop salads and pastas.